Side light : Smart SuperFlash . Why ? Just to warn drivers that I am just a bit wider than a standard bike. 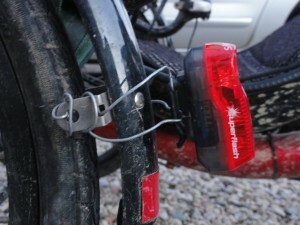 Pros : well, this adds the flashing mode – the one I always use – to the steady rear light. Bright flash, compared to similar 2-AA-batteries lights. Experience : the more stuff you had to increase your visibility in the dark, the better I guess. This one has a bright flashing, quite good I would say with standard batteries.